I can’t even believe I’m saying this, but I’m already getting ready to send my kids back to school. We’re in this weird place–it’s still July, it’s 5 million degrees outside, we’re still technically in the middle of summer, but my kids have been out of school for 2 1/2 months. Swimming lessons have ended, we’re home from vacation, day camps are over. New school uniforms are hanging in the closet, school supplies are about to be purchased. I’m back to a place where I need quick weeknight meals, but there’s still plenty of summer nights left for grilling. 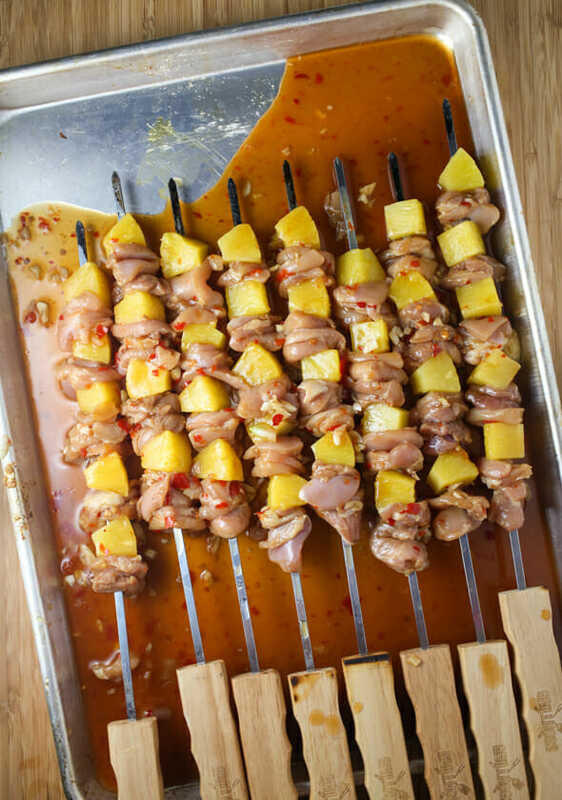 Enter this recipe for Sweet Chili Pineapple Chicken Skewers. The marinade is quick and easy (and so incredibly delicious…pretty sure I could drink it!) and as long as I can whip everything together earlier in the day, by the time dinnertime rolls around, it’s ready in a matter of minutes. Plus, my family, including my 4-year-old who, I’m dead serious, went 2 entire days on our vacation where he didn’t eat a thing, absolutely inhaled this meal. Now, let’s just get one thing out of the way–we’re going to be using chicken thighs instead of chicken breasts. You might be wondering why chicken thighs? Sara and I have a long-established history with a love of chicken thighs–they’re so much more juicy and flavorful than chicken breasts, plus they cook very quickly (and they’re harder to overcook). They’re extra-fantastic on the grill because they take on all sorts of complex, smoky flavors. Trust us. You’ll love them. Anyway. Place the chicken pieces in a large zip-top bag and set aside. 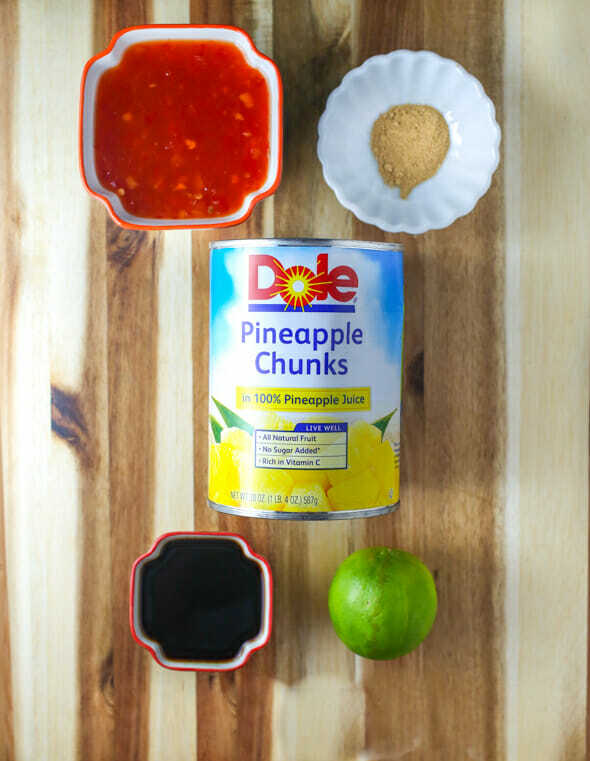 To make the marinade, you’re going to need the juice from a 20-ounce can of pineapple chunks (like Dole), low-sodium soy sauce (for me, it’s a taste thing rather than a health thing, but the health thing is definitely an added bonus), sweet chili sauce, garlic, reserved lime juice, and ground ginger. Juice one of the limes and reserve the other lime for later. Drain the can of pineapple, but reserve the juice. Canned pineapple is a pantry staple for me! 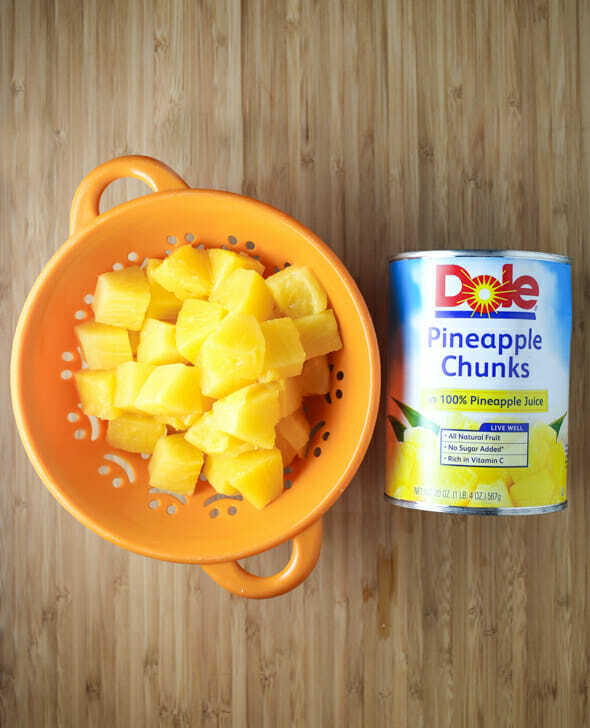 I don’t always buy name-brand stuff, but when it comes to pineapple at my house, it has to be Dole–both the juice and fruit seem to taste the most fresh and don’t have that weird canned fruit taste. It’s one of the few canned goods that I love just as much as fresh and I seriously have every size and variety–tidbits for pizza, crushed for mixing in with rice, rings for throwing on the grill and adding to burgers, and chunks for skewers and snacking. I do love fresh pineapple, but it’s often expensive and I have a hard time getting over how little edible pineapple I get vs. the stuff I throw away. Plus, I can use the juice and I always know what I’m getting with canned pineapple (I’ve been burned by gross fresh pineapple in the past). 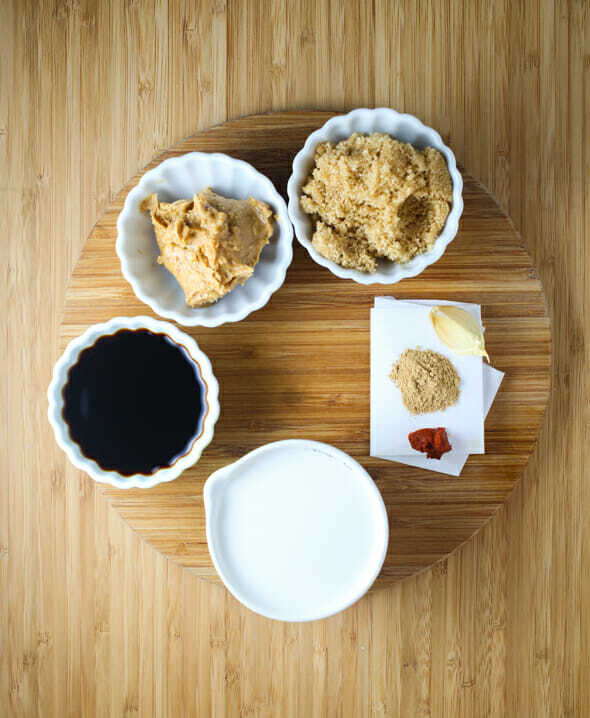 Whisk together the marinade ingredients and reserve 1/4 cup of the marinade. Pour the remaining marinade over the chicken pieces, seal, and refrigerate for at least 4 hours or up to 24 hours. When ready to cook, preheat grill over medium-high heat. 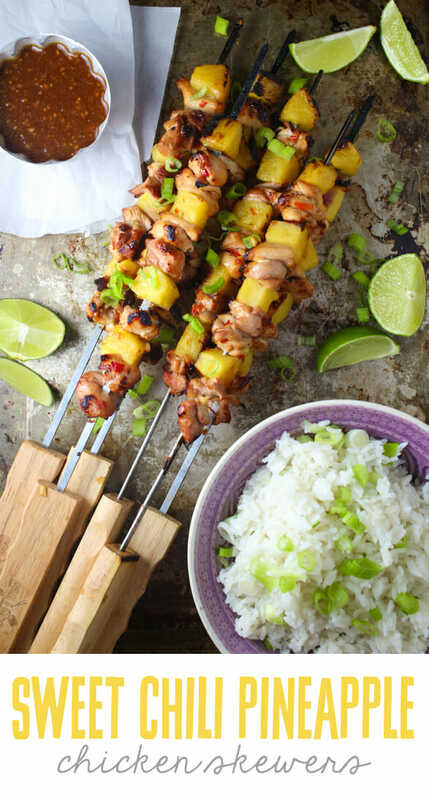 Alternately thread the chicken pieces and pineapple onto skewers. Turn grill to medium, lightly oil the grates, and cook for 4 minutes. Turn the skewers and cook for another 4 minutes. While the chicken is cooking, prepare the peanut sauce. You’ll need creamy peanut butter, coconut milk, soy sauce, brown sugar, garlic, ginger (fresh or ground, your call–same amount either way), and a little bit of red curry paste. Heat the oil in a small saucepan over medium heat. When hot, add the minced garlic and cook for about 1 minute or until fragrant. Combine the remaining peanut sauce ingredients in the pan and heat, stirring frequently, until the mixture is smooth. Remove from heat. When the skewers are done, transfer to a serving platter and drizzle with reserved 1/4 cup of marinade. Juice the remaining half lime over the skewers. If desired, drizzle the peanut sauce over the skewers; otherwise, you can serve it as a dipping sauce. Garnish with chopped green onions and serve immediately. 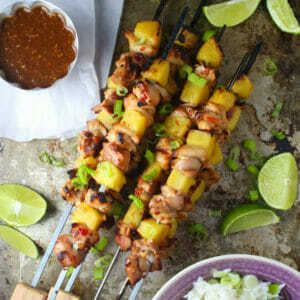 Moist and flavorful pieces of chicken thigh are marinated in an incredible sweet chili marinade and grilled on skewers with chunks of juicy pineapple and drizzled in a sweet and savory peanut sauce. Place the chicken pieces in a large zip-top bag and set aside. Juice one of the limes and reserve the other lime for later. In a small mixing bowl, whisk together the reserved pineapple juice, soy sauce, sweet chili sauce, garlic, reserved lime juice, and ginger. Reserve 1/4 cup of the marinade. Pour the remaining marinade over the chicken pieces, seal, and refrigerate for at least 4 hours or up to 24 hours. When ready to cook, preheat grill over medium-high heat. 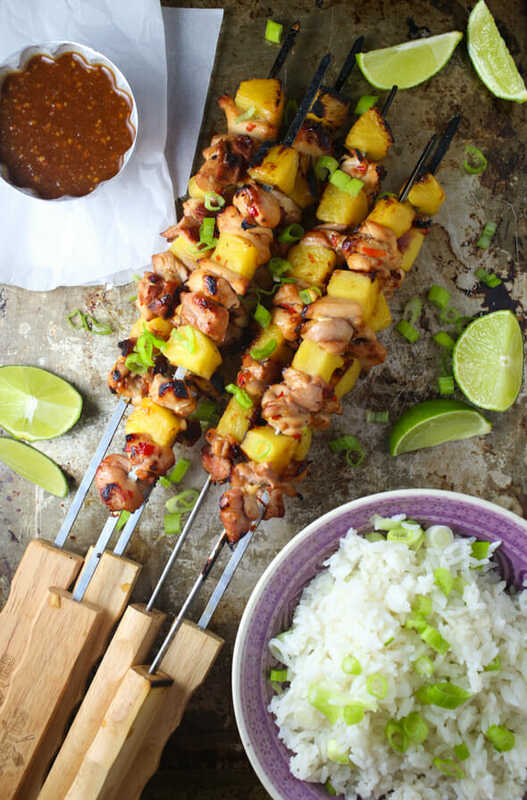 Alternately thread the chicken pieces and pineapple onto skewers. Turn grill to medium, lightly oil the grates, and cook for 4 minutes. Turn the skewers and cook for another 4 minutes. While the chicken is cooking, prepare the peanut sauce. Heat the oil in a small saucepan over medium heat. When hot, add the minced garlic and cook for about 1 minute or until fragrant. Combine the remaining peanut sauce ingredients in the pan and heat, stirring frequently, until the mixture is smooth. Remove from heat. If you’d like to serve these as appetizers, try preparing them on toothpicks or 6″ skewers. This recipe was sponsored by Dole, but the recipe, photographs, and opinions are completely our own. 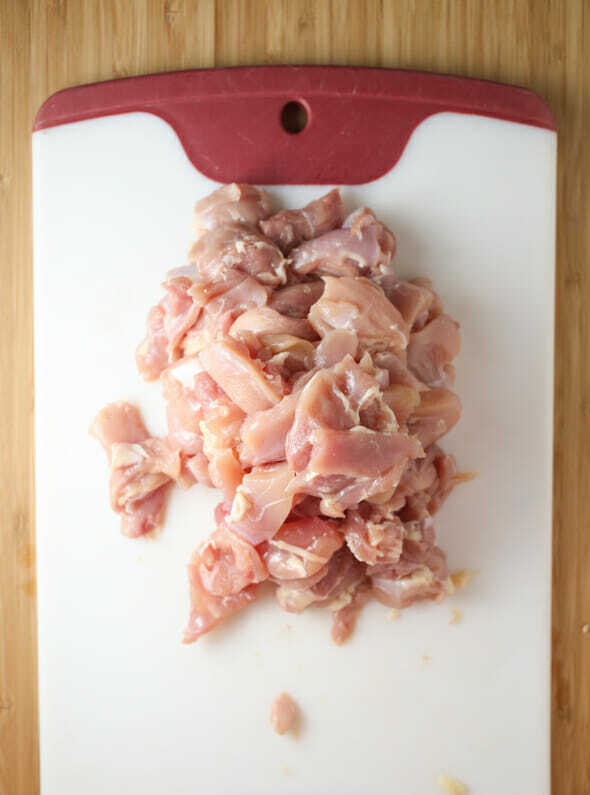 So I’m nervous about chicken thighs…do they have a lot of tendons and gristle? I worry about them being chewy. I bought these awesome Grill Hogs skewers on Amazon for your chicken kabobs with Italian dressing and they (and the kabobs) were as amazing as you said they were! Nope! Not the boneless skinless ones, at least–they’re just super juicy and fall-apart-y. They *are* still pretty fatty, but it’s easy to trim it off. And I’m so glad you love the Grill Hoggs–they’re my favorite! Looks delicious! I am a little confused on the reserved lime juice situation. Could you please clarify how the lime juice is used? It’s in there, but it’s super easy to miss, haha! After you pull the kebabs off the grill, juice the reserved lime over them. 🙂 Hope that helps! Can you use almond butter or any non nut butters for the peanut sauce? I have a child allergic to nuts. But really want to try the recipe with or without the sauce. Is there a sauce option for those who can’t get their kids to eat any of the peanut butter substitutes, but can’t use peanut butter due to allergy? Or is there another sauce in your repertoire that you can point me to that would pair? I didn’t make the peanut sauce and we didn’t miss it at all! I did thicken the remaining 1/4 cup of the chili sauce mixture and we dipped in that. These were so yummy! These look heavenly! I need to make these asap! In Georgia we only have a week left of summer break! (I think some are starting this week too.) It’s so miserably hot here though, it’s hard to even find a time you can go to the park or play outside, so we are pretty ready for them to get back in the classroom. We’re totally in the same boat in Louisiana–it seems like once July hits, everything dies and we’re all antsy to go back to school. So I’m in the market for a new grill and am curious as to what kind you or Sara have and/or would recommend? Thanks! I made these for dinner this weekend and it was awesome! I had never cooked with thighs before – you are right, they are amazing and I am hooked! The marinade was good but the peanut sauce stole the show in this recipe! Love your blog and this recipe just confirmed why you guys are the best! This comment totally made my night!!! I’m so glad you loved them! Oh. My. Goodness! That peanut sauce, though. The chicken was fantastic, but the sauce put it over the top. Thanks for another crowd pleasing meal! I’m SO HAPPY you loved it! And yeah…that peanut sauce…??? And now I have to add…my weirdo husband loved the sauce so much that he dipped his chocolate chip cookies in it for dessert. I am excited to make these but I have a random question. Do chicken thighs smell different than chicken breasts? I never use thighs and just bought the yesterday and it should be good for 4 more days but it has a different smell. Am I crazy?!? Just don’t want to get people sick. Thanks! Good chicken thighs shouldn’t smell noticeably different than chicken breasts. I *have* noticed that chicken thighs tend to go bad faster than chicken breasts and that they’ll take on kind of a fishy smell, so if that’s the case, I’d take them back to the grocery store (especially if they’re good for 4 more days.) Hope that helps! This looks amazing! Any advice for trying this in the oven or even in an electric griddle ?? No grill! Next Post ❯ Next post: Black Friday in July- NUME Curling Wand Sale!